Okay I have to share my latest obsession with y’all: Apple Cider Vinegar based (ACV) elixirs and blends. I’ve used ACV for a long time in my vegan cooking, especially for recipes such as raw salad dressings and sauces. And I’d heard of people drinking it straight, but had never tried that or any kind of ACV elixir or blend before. 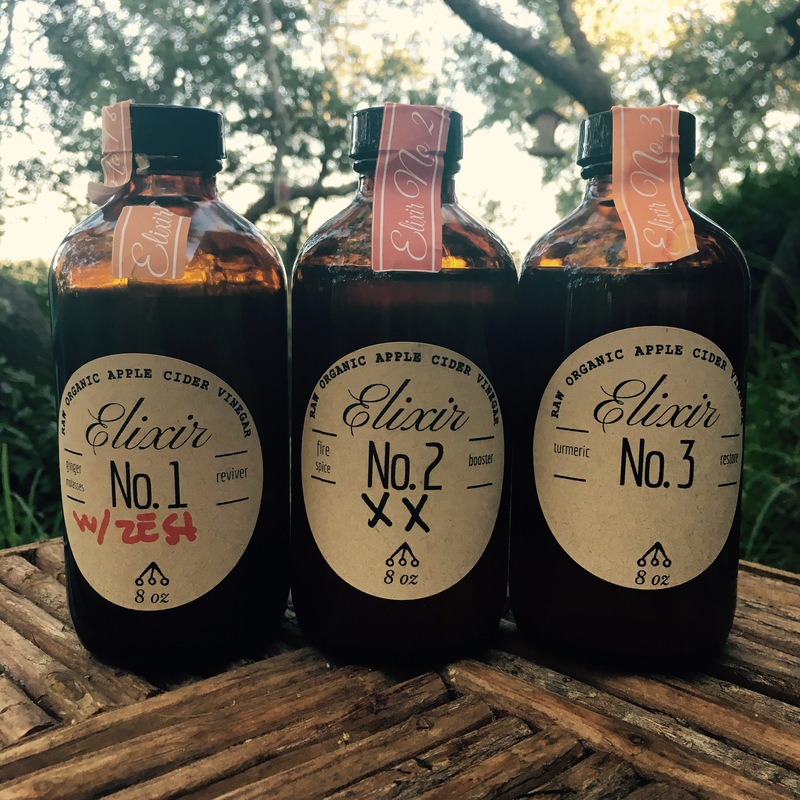 Recently however, I was at a local farmers market where I ran into Kelley Slagle from The Vinegar Joint who sells her homemade Apple Cider Vinegar elixirs and they totally blew my mind. I bought two of the three on the spot (would have bought more but my thrifty husband was scouring over my shoulder, LOL) and within a few days had already looked her up and emailed her ordering three more bottles (one of each)! I’ve been drinking 1-2 Tbsp straight three times a day. I have to admit, it’s kind of cool to have a reason to break out my pretty shot glasses. Let’s be real, those bad boys had quite a bit of dust on them! And don’t be fooled, I don’t shoot these fine vinegar elixirs, I sip them slowly and savor every last drop! PS. If you want to see where Kelley will be selling next, check out her upcoming event schedule of markets on Facebook! Although I didn’t try her tonics at the market, her site says that she also carries “…artisan vinegar tonics that are handcrafted with fine artisan vinegar made in the slow old-world method… with fresh produce and whole food ingredients…NEVER any extracts, concentrates, powders or anything artificial.” Her site also mentions “…specialty malt and wine vinegar made with local craft beer and wine.” Hm… considering how incredible her hand-crafted elixirs are, I really may need to look into this more, LOL! Bragg also has this 5 minute informational video and testimonials that even mention Hollywood celebrity ACV consumption! Additionally, they sell drinks such as the Limeade, Ginger Spice, or Concord Grape Acai among several others (none which I have tried yet, but sound fabulous to me)! They even sell a cleanse concentrate! PPS. I love Bragg’s Liquid Aminos too and use in place of soy sauce in many dressings. I’m not saying that ACV is this (since my research for health benefits is so minimal), but as with a lot of potential “health gimmicks,” I believe that if we truly have faith or confidence that something is helping us to feel better, then who cares if it might be just a placebo?! Our minds are extremely powerful and so to a certain extent, if we use that to help heal ourselves instead of whatever potential ploy that we believe in at the moment, who cares! And all this talk of fermentation got me thinking about another project that I’ve been wanting to make: home brewed kombucha (fermented tea)! And I actually kicked that off two days ago and am in the first phase of fermentation right now so stay tuned for that as well in a couple of weeks! Oh, and a few last things…with summer coming up, I plan to add another toddler survival swim lesson post to my Swimming Category like this one or this one, as well as a few new swimming hole reviews in the San Antonio area to add to last year’s collection (Blue Hole, Jacob’s Well, and Hamilton Pool), and a few other summer vacation reviews. Additionally, I have planned my first ever Ghost Post (anonymous guest post) about a feminine menstrual cup product! Random and intriguing for all of us females, haha! So lots on the radar with Livin With The Lehnhoffs in the next few months!